Without a doubt, Davey the Hubbers and I are the most spoiled parents on the planet. We have the sweetest, most tranquil and easy baby. We can honestly say that we’re having so much fun with her. I had read so many articles (okay, blog posts) lauding the difficulties of newbornhood – the breastfeeding pains, the horror of sleepless nights, the complete loss of self. I have admittedly been super lucky not to have any issues with feedings, but I also haven’t framed these few weeks as something to survive in spite of nightmarish exhaustion. Instead (not to be all self-righteous), I’ve embraced the ups and downs of these first 6 weeks of our Nora Beth’s life. And, for me, there hasn’t been a loss of self. In fact, I doubt I’ve ever felt more of a wholeness in myself. Never one to be described as laid back, I have surprised myself with how easygoing I’ve been in motherhood. Not that I’m doing it all right… far from it. From burning her scalp during her third bath to elbow her in the face last week trying to hurriedly take off my shirt to let her feast to being quick to try and correct something Davey is doing with her (something I’m working so hard to avoid). I take solace in the fact that she won’t remember these moments. She is a treasure, and I am more fulfilled than I imagined possible. One of my favorite things to do with her is to pop her in her infant seat, set her on the counter while I cook or bake, listen to some worship tunes, and explain all the steps of the recipe. I know she isn’t absorbing any of the information, but it feels like a sweet time together that I hope is laying the foundation of many memories in the kitchen together to come. Here are the meals she and I will be whipping up together this week. 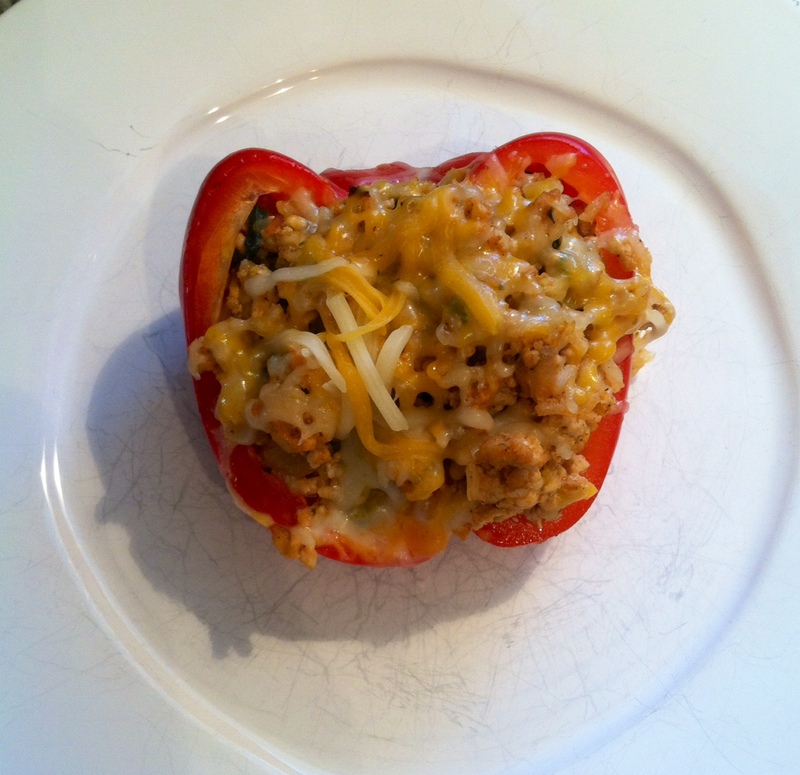 Turkey Stuffed Peppers – I loved stuffed peppers. I followed this recipe nearly exactly when I made them for lunch over the weekend, but these are the perfect “clean out the fridge” dish. If I have vegetables rolling around the drawer on their last legs, I’ll give them a quick dice and toss them in the saute pan. Hot Pepper Noodles – Giving this new recipe from Bon Appetit a whirl! Thai Green Curry Chicken – Another Bon Appetit dish I’ll be trying for the first time. My hopes are high! Chicken Enchilada Quinoa Bake – I’m obsessed with Trader Joe’s enchilada sauce. Weird. I’ve wanted a recipe to incorporate it that was healthier than traditional rolled enchiladas.